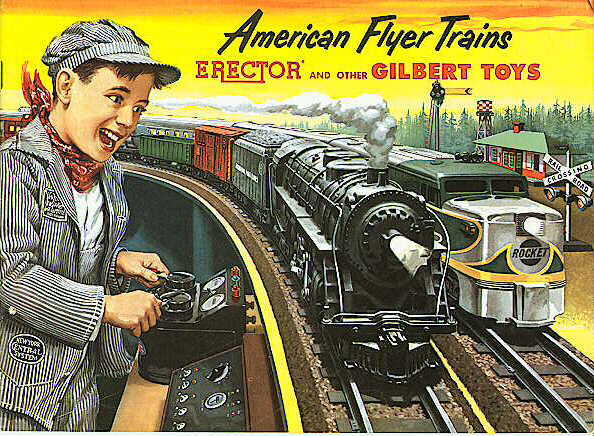 1953 Gilbert American Flyer Consumer Catalog (D1714) Mint Condition - $25.00 : Olson Hobbies, Welcome To The Train Page! 1953 American Flyer Consumer Catalog (D1714). Catalog is printed partial and full color. Some of the nicer sets pictured include the 466 Comet Passenger, 474-475 A-A Rocket Passenger Silver Flash Freight and Passenger set, 336 Northern and 326 Hudson passenger sets. Accessories for the year include 751A Log Loader, 583A Magnetic Crane and K771 Cattle Loader to name a few. A complete line of rolling stock, wooden style railroad buildings and other accessories also pictured to go with the American Flyer. Other items shown are the Erector, Chemistry Set, Mysto Magic Sets, Tool Chest, Power Tools and Microscope Sets.